Nouman, I.A. Knowledge, Attitudes and Practices (KAP) Survey about Hydration in Pediatric Anesthesia Patients; Findings from a University Teaching Hospital. (2016) J Anesth Surg 3(1): 131- 134. © 2016 Nouman, I.A. This is an Open access article distributed under the terms of Creative Commons Attribution 4.0 International License. Guidelines are important for standardizing practices and identifying gold standards. It had been observed that there was no recent consensus on intravenous hydration practices in the pediatric age group. The author shared concern with his senior colleagues that pediatric patients needed a more consensus based intravenous hydration. We wanted to have a snap shot survey of our current practices and identify areas where improvements could be carried out. We also wished to identify the variety of fluids being preferred for hydration and if there was any discernible pattern among the seniority of anesthetic colleagues. Department of Anesthesiology at Aga Khan University, Karachi conducts more than 200 pediatric surgeries per month. This figure has been derived using the hospital information systems, which has stored data of all the cases done during the last 15 years. The Department of Anesthesiology covers fourteen main operation theaters and four Day Surgery Theaters. Our patients are sicker and more malnourished reflective of being a tertiary referral center. A Google based questionnaire was emailed to the 42-credentialed anesthesiology faculty and 22 trainees (three or more years of anesthesia experience). The list was compiled using the Outlook Express Contact list, maintained at the university main server. Responders were primarily divided into trainees and credentialed staff/Consultant involved in general pediatric anesthesia cases. Responders were requested to answer questions pertaining to their prevalent day-to-day practice of pediatric hydration. An email was sent by the owner of the survey explaining the rationale of the survey and seeking their response to the questions. The potential respondents were informed of anonymous nature of the survey and it was explicitly stated there would be no negative or positive repercussions of taking part or giving any answers to the questionnaire. Thus, informed consent was implicit in the request. Those who did not consent exercised their right by not participating in the survey after the request. The collated data was anonymous and only the principal coordinator of the survey secured the access. The number of responders who were formally credentialed in pediatric anesthesia were 23(59 %) and trainees were sixteen 16(41%). The number of people satisfied with the current fasting practices of pediatric patients were 21(53.8%) whereas 18(46.2%) were unsatisfied. Please see Table (1). Satisfaction of anesthesiologist with current fasting practices of pediatric patients. Do you treat neonates, infants and children as separate age groups with different criteria for fasting? What is your preferred method of hydrating a pediatric patient (perioperatively)? What is your preferred fluid of choice with pediatric age group? The proportion of people treating neonates, infants and children as separate and different age groups were 24 (61.5 %) whereas 15 (38.5%) treated the whole group as a single age cohort. An overwhelming majority 26 (66.7%) used intravenous as their preferred route for hydration; the number of people using oral as preferred route was 13 (33.3%) of the total group. Please see Figure (1). Figure 1: Anesthesiologist responses about the factors associated with perioperative fluid therapy of pediatric patients. Most common fluids of choice were Dextrose Saline and Dextrose Water which were used by 13(33.3%) and 10(25.6%) respondents respectively. The number of people using Hartmann or Ringers Lactate was 11 or just 28% of the entire group. Nearly 27 (69.2%) answered that they normally replenished the fluid deficit during the actual anesthetic period with a significant number 13 (35.9%) responding that did ‘no’ because logistical reasons prevented them from pre-arranging intravenous therapy in the wards. Please see Table (2). 4(17.9 %) respondents felt that accurate hydration was a luxury given our high patient load and keeping in mind their ongoing illnesses. Our survey received responses from all the groups of varying experience in the Department. Nearly half the responders were uncomfortable about current state of perioperative fluid therapy of children during anesthesia. We were concerned that nearly one third treated all children as one group with no varying fasting and hydration criteria for neonates and younger children (toddlers). It appeared worrying that only intravenous route was deemed appropriate for hydration by an overwhelming majority of anesthetists. Most popular fluid of choice was the hypotonic combination. It was also highlighted that a larger proportion of anesthetists considered the anesthetic time alone as the only time meant for hydration. Old theories have been debunked in light of new scientific findings. Previous studies have been identified as being potentially risky and causing iatrogenic complications e.g. hyponatremia, altered mental status, increased hospital stay and even increased patient mortality[1-3]. One of the most seminal studies on pediatric perioperative studies pinned their recommendations on maintenance, replenishment rather than on going surgical losses, hydrating third space losses (which is now considered a non-space). Based on knowledge from those times, these studies recommended types of fluids which led to hyponatremia were inherently hypo-osmolar and hypo tonic. There has been a paradigm shift in fluid studies the concept of deficit has been challenged in adults where it was shown that despite prolonged fasting periods, the normal intravascular volumes did not change. The Holliday-Segar method of calculating maintenance fluid therapy for children is increasingly being debated and concerns are raised about its appraisal. A recent meta-analysis has shown that isotonic fluids are conclusively better than hypotonic fluids for maintenance IV fluids in children who are in hospital. This was condensed from ten RCT’s. This could be considered by far the latest evidence based advice on this topic. Hyponatremia is the most common electrolyte abnormality in children who are in hospital. Children have a lower threshold of having neurological problems with relatively higher levels of serum sodium. It is to be noted that although hypotonic, hypo-osmolar fluid therapy may be the main culprit but there are other factors leading to Hospital acquired hyponatremia and hyponatremic encephalopathy in children. Anti Diuretic Hormone (ADH) secretion causing must be kept in mind. ADH secretion during the perioperative period is a major stimulus for hyponatremia. Surgical stressors like pain, nausea, vomiting, narcotic use and surgical stress all lead to ADH secretion in patients. In another article from Germany the same views have resonated. While intravenous hydration is of utmost importance. It is increasingly deemed better practice to use Ringers Lactate and Normal Saline as compared to Dextrose Water. The difference between the two groups is tonicity and isotonic fluids lead to fewer complications than hypotonic solutions. Normal Saline led to hyperchloremic acidosis and therefore Ringers Lactate was deemed comparatively better. Globally pediatric anesthesia societies and professional bodies have identified and registered these changes[1,3]. In light of these findings, the current recommendations suggest use of isotonic and iso-osmolar fluids like LR (Lactated Ringer) and 0.9% Normal Saline. Risk of hypoglycemia has been localized to select patient groups only i.e. preterm, neonates and neonates with necrotizing enterocolitis or those who are likely to have sepsis. Interestingly, in otherwise healthy pediatric populations intravenous glucose administration is not mandatory. Regarding colloids, studies have shown that colloids have not been shown to have any major noticeable advantage over crystalloids; the exception being major blood transfusions or major hemorrhage, where blood transfusion in the ratio of 1:1 is beneficial. In other study Colloids were not found to be superior in context of intravenous hydration. The practice of hydrating children in the perioperative fluid has evolved over the last several decades[2,3]. We have come a long way from not giving anything in lieu of fluids to giving too much and what is being done today which is just enough. This has truly been a journey of discovery and we find our colleagues practice marching on the trail of evolution. A significant lot of our credentialed faculty was trained in early 1990’s by teachers who had been trained in the 1770’s. Not surprisingly we find that they have been practicing what was standard norm in those times; it was only much later that the risk of hyponatremia, hypo-osmolar fluid therapy, increased mortality and increased hospital stay were identified. That would explain the use of Dextrose Water or Dextrose Saline in some of the respondents as fluid of choice. The current emphasis on Enhanced Recovery and Fast track Day Surgery has also impacted the practice. There is more emphasis now on shorter fasting times, quicker oral intake of clear fluids instead of intravenous route and reduced fluid administration if not restricted. 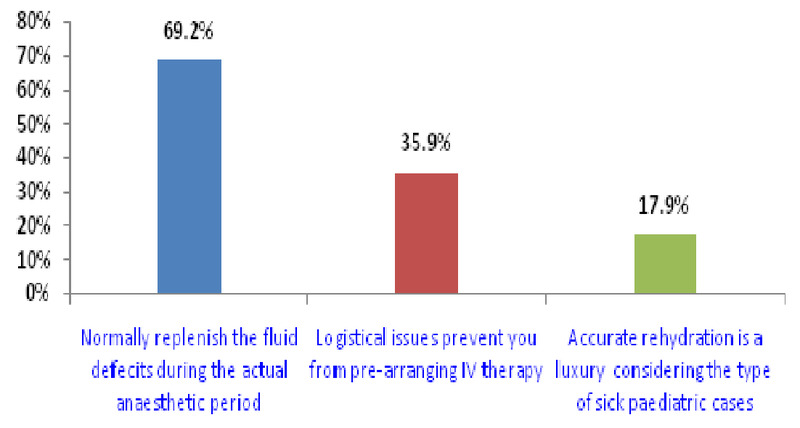 It was highlighted in our survey that only one quarter considered oral route as admissible for fluid therapy. We have thus identified an area where we can educate and improve upon our practice. This survey helped us identify that there were still sizeable staff that did not differentiate among different pediatric age groups for fasting duration. Prolonged fasting duration lead to complications e.g. hypoglycemia, weakness, postoperative nausea vomiting (PONV) and delayed recovery. It is increasingly prevalent these days to differentiate fasting for solids, semi solids and clear liquids. Watery juices can be had for as close as two hours prior to general anesthesia; this has shown to be better and increased patient well being. Our survey illustrated that they overwhelming majority was treating the hypovolemia only in the intraoperative period. They need to be educated that hydration is a peri-operative therapy and not just an anesthetic procedure. So fluid should be replenished both pre operatively and post operatively. It was also highlighted that logistical issues prevented prior rehydration of children scheduled for surgeries. It can be extrapolated that is so because of high percentage of our patients who are either day care cases or get admitted too late in the day to get properly hydrated in the wards. Some limitations of our study are that it is only representative of one institute albeit the best place in the region. The results cannot speak for hospitals and prevalent practices in other health care facilities in the region. Multi center studies would be the best way to determine a more accurate picture. Another limitation is that we did not take into account the volume status of the patients. That influences the intravenous therapy practices of anesthetists and would change with hypo-volemic to euvolemic patients. This survey helped us identify our blind spots in knowledge, attitudes and practices. Considerable lacunae were identified in updating practices regarding policies. We would therefore like to educate our staff and then repeat an audit seeing if people have gained any measureable improvement in their knowledge and practice. The author hopes that in absence of any other literature about this pediatric hydration from Pakistan, this survey might act as a guiding light for further studies and lead to more detailed studies, which would lead to refinement of our practice on a countrywide basis. 1. Bailey, A.G., McNaull, P.P., Jooste, E., et al. Perioperative crystalloid and colloid fluid management in children: where are we and how did we get here? (2010) Anesth Analg 110(2): 375-390. 2. Arya, V.K. Basics of fluid and blood transfusion therapy in pediatric surgical patients. (2012) Indian J Anaesth 56(5): 454-462. 3. Holliday, M.A., Segar, W.E. The maintenance need for water in parenteral fluid therapy. (1957) Pediatrics 19(5): 823-832. 4. Holliday, M.A., Friedman, A.L., Segar, W.E., et al. Acute hospital-induced hyponatremia in children: a physiologic approach. (2004) J Pediatr 145(5): 584-587. 5. Stewart, P.C., McGrath, K. Pediatric maintenance fluids. (2007) Br J Anaesth 98(3): 406. 6. Jacob, M., Chappell. D., Conzen, P., et al. Blood volume is normal after pre-operative overnight fasting. (2008) Acta Anaesthesiol Scand 52(4): 522-529. 7. Wang, J., Xu, E., Xiao, Y. Isotonic versus hypotonic maintenance IV fluids in hospitalized children: a meta-analysis. (2014) Pediatrics 133(1): 105-113. 8. Alves, J.T., Troster, E.J., Oliveira, C.A. Isotonic saline solution as maintenance intravenous fluid therapy to prevent acquired hyponatremia in hospitalized children. (2011) J Pediatr (Rio J) 87(6): 478–486. 9. Murat, I., Dubois, M.C. Perioperative fluid therapy in pediatrics. (2008) Paediatr Anaesth 18(5): 363-370.